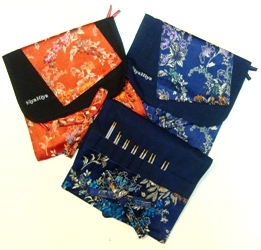 A lovely delivery to receive – the HiyaHiya Interchangeable needle sets are here! These silky smooth needles (US size 2-8) are made from stainless steel and come with a 16″, 24″, 32″, and 40″ nylon cord. These are such beautiful needles, not to mention the stunning silk case! We also carry the 6″ DP sock sets, and the 9″ circular sock needles for those opposed to double points. Take a look at what you can make with the 9″ circulars here. A great big box of Handmaiden was also delivered yesterday. 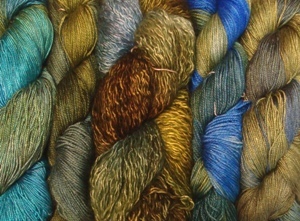 We’ve restocked all of our favourite yarns like the Devins Toques, Cashmere Cloche, Swiss Mountain Silk, Maiden Hair, Sea Silk, and the ever so popular Bias Shawls. Kathleen loves these Bias Shawls and is working on her second one! Below is the Mini Maiden, made from 50% Wool and 50% Silk. With 500m on each skein, 2-3 will do a nice sized shawl. 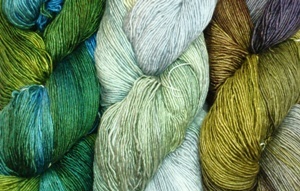 This is some of the softest yarn you’ll feel – we promise! Take a look at Alison’s Norwegian Woods Shawl that she made in Mini Maiden. No-one would guess that Anina’s favourite colour is green, would they? New colours to go on our shelves this season are hemlock, cedar, boreal, saltspray, and forest fire. Nancy’s Knit Knacks have also sent us some more of their unique notions such as double point needle holders, knit lights, and electronic row counters. Their new “Perfect Notion Case” is perfect for all of your little notions, buttons, or beads. These sturdy plastic cases have five different compartments that open and close individually. Who couldn’t use one of those? This entry was posted on Saturday, August 15th, 2009 at 3:34 pm	and is filed under Uncategorized. You can follow any responses to this entry through the RSS 2.0 feed. Both comments and pings are currently closed.